Not to be confused with Classic NES Series. Classics (or Classic Edition Series), also known as the Nintendo Classic Mini in Japan and PAL regions, is a series of small consoles that contain a set number of pre-installed video games representing a specific console era. So far, only the NES Classic Edition, the SNES Classic Edition, and their Japanese variants, the Nintendo Classic Mini: Family Computer and Nintendo Classic Mini: Super Famicom, have been confirmed. The NES Classic Edition (known as the Nintendo Classic Mini: Nintendo Entertainment System in Europe and Australia) is a smaller version of the Nintendo Entertainment System, which was announced on July 14, 2016, and is the first entry to the Classics series. For this iteration, it uses an HDMI cable, which is packaged with the console and, rather than using cartridges, includes 30 NES titles pre-installed. The games feature suspend points, allowing the player to resume where they last left off at a later time. The console also comes with a controller based on the original NES Controller, but with a connector based on those used by Wii Nunchuks, which can also be used to play Virtual Console NES games on Wii or Wii U by connecting it to a Wii Remote. The NES Classic Edition also supports Wii Classic Controllers. It was released in Australia on November 10, 2016, and in the Americas and Europe on November 11, 2016. A Japanese version of the NES Classic Edition, the Nintendo Classic Mini: Family Computer, was released exclusively in Japan on the same day, and includes a slightly different software line-up than its overseas counterpart. Upon the system's release, stores sold out of the NES Classic Edition almost immediately after they went up for sale. Nintendo had recognized this and stated that there would be a "steady flow of additional systems through the holiday shopping season and into the new year." On April 2017, a Nintendo representative informed IGN that the system was being discontinued, and the final shipments would be sent out that month. In September of that year, Nintendo announced that the system would be re-released in summer 2018. It was eventually confirmed to be re-released on June 29, 2018. Production was confirmed to be discontinued in December 2018, with no more stock to be made available after the holiday season. On September 29, 2016, Nintendo announced the Japanese version of the NES Classic Edition, the Nintendo Classic Mini: Family Computer. Similar to its overseas equivalent, it includes 30 pre-installed Family Computer games, although some of the games are different from those on the NES Classic Edition due to region exclusivity. While playing a game, players are able to save to up to four Restore Points at any time. It was released in Japan alongside the NES Classic Edition on November 10, 2016, where it was similarly sold out almost immediately upon launch. It was eventually re-released on June 28, 2018. In addition, a special gold-colored version was released marking the anniversary of Weekly Jump. The Super NES Classic Edition (known as the Nintendo Classic Mini: Super Nintendo Entertainment System in Europe and Oceania and Nintendo Classic Mini: Super Famicom in Japan) is a smaller version of the Super Nintendo Entertainment System and the successor to the NES Classic Edition, which was announced on June 26, 2017. It includes 21 pre-installed SNES titles, and like the original SNES, its physical design varies by region. Unlike its predecessor, the SNES Classic Edition now comes packaged with two Super NES Classic Edition controllers. Like the NES Classic Edition controller, the controller also features a connector similar to Wii Nunchucks. The SNES Classic Edition supports Wii Classic Controllers. It was released in North America and Europe on September 29, 2017 and in Oceania on September 30, 2017. Like its predecessor, it was confirmed in December 2018 that the Super NES Classic Edition would not be restocked following the holiday season. On a side note, the Super NES Classic Edition includes Star Fox 2 as its sole unlockable game, marking the first time where that game has been released to the public. Announced around the same time as the Super NES Classic Edition, the Nintendo Classic Mini: Super Famicom was released in Japan on October 5, 2017. Similar to the Nintendo Classic Mini: Family Computer, this version of the system features a slightly different game catalog from the overseas release. The Mario games included in the console are the same as those on the Super NES Classic Edition, with the addition of Panel de Pon, a title that was re-released as a Yoshi game outside of Japan under the name Tetris Attack. During the release of the NES Classic Edition, Nintendo temporarily revived the Nintendo Power Line from November 11, 2016 to November 13, 2016. When contacted, clips recorded by former Nintendo Game Play Counselors would play, giving hints, tips, and their behind-the-scenes stories for various games. Two of the games featured were Super Mario Bros. and Super Mario Bros. 3. 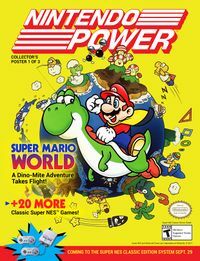 To celebrate the release of the Super NES Classic Edition, Nintendo released three images styled like the Nintendo Power magazines that were created in the SNES era, one of which having Super Mario World as the focus. Physical copies of the images can also be bought at PAX West 2017. ↑ Nintendo. (July 14, 2016). Nintendo Classic Mini: Nintendo Entertainment System. Nintendo UK. Retrieved July 14, 2016. ↑ Gilbert, B. (May 14, 2018). Nintendo is about to bring back its outrageously popular $60 NES console. Business Insider. Retrieved February 10, 2019. ↑ 6.0 6.1 Gerblick, J. The NES Classic and SNES Classic Are Being Discontinued. Game Rant. Retrieved March 11, 2019. ↑ Nintendo. (September 29, 2016). ファミコンが、手のひらサイズで"再"登場！. Nintendo. Retrieved September 30, 2016. ↑ Nintendo. (September 29, 2016). ニンテンドークラシックミニ ファミリーコンピュータ 紹介映像. YouTube. Retrieved September 30, 2016. ↑ Nintendo announces the Nintendo Classic Mini: Super Nintendo Entertainment System. Nintendo.com.au. Retrieved June 27, 2017. ↑ ファミコンに続いて、スーパーファミコンが小さくなって再登場！. Nintendo. Retrieved June 27, 2017. ↑ Forde, Matt (November 4, 2016). Nintendo Celebrates the NES Classic Edition by Going Retro With The 'Power Line'. Nintendo Life. Retrieved October 1, 2017. This page was last edited on March 11, 2019, at 05:23.